Stommel Haus is well known amongst home builders in the UK who value high quality and healthy homes and which are interested in building a very energy efficient luxurious home. The Stommel Haus exterior wall was shortlisted for the Build It Award for Best Technology and is type approved for Building in the UK. The energy efficiency is legendary and now Stommel Haus has again increased the thermal capacity of its exterior walls to comply with ever rising energy efficiency requirements in Germany. 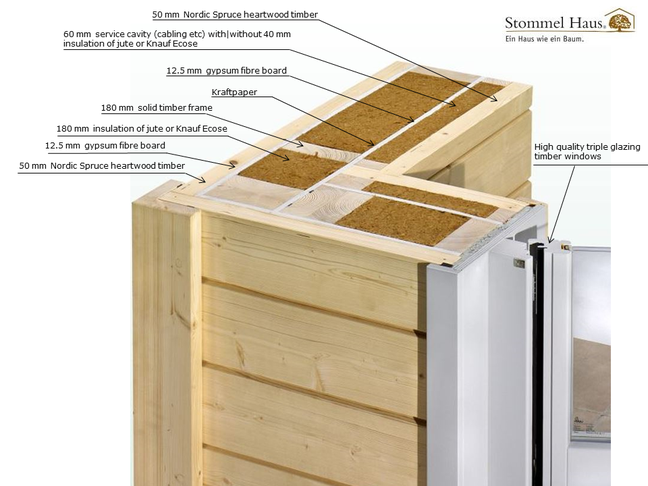 The exterior walls of a Stommel house are made primarily of solid Nordic spruce heartwood which is able to regulate the air humidity in a house. The 36.5 cm thick sandwich wall, with its 18 cm thick timber frame in the center, is a diffusion open construction, i.e. no membranes are used that could collect condensation. The timber walls can store air humidity and release it when the air gets too dry inside. This kind of construction enables Stommel Haus to build air-tight homes without the need of expensive, high maintenance MVHR systems. The energy loss through thermal transfer is 0.16 W/m²K compared to 0.45 W/m²K in a conventional brick wall. Constructive wood protection is applied when building a Stommel Haus home, the wall is devoid of any wood preservation or toxic elements. The exterior of the timber house wall is decoupled from the central timber frame giving clients stylistic freedom to decide whether the 50 mm thick robust heartwood is used or render or an attractive combination of both. The timber on the outside is invisibly fastened on the timber frame providing not only an aesthetically pleasing exterior but also avoiding any moisture getting into the timber through screw holes. 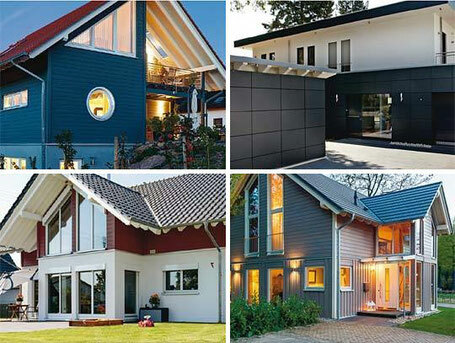 There are “Elementar” or “Fineline” exteriors providing interesting stylistic alternatives. Technical changes to the fitting of the house are easily applicable by using the service cavity on the inside of the wall which is again decoupled from the insulated central timber frame. Retrofitted installations and cabling therefore do not damage the integrity of the wall or jeopardize the air-tightness of the building. The approved construction with its great sound insulation is produced by computer aided precision machines. We would love to demonstrate this to you during one of our regular guided tours through the factory near Cologne in Germany (contact info@stommel-haus.co.uk to arrange a visit). The exterior wall can be further insulated with a 12 cm thick thermal wood panel if you plan to achieve passivhaus standard. The wonderful properties of the timber are accompanied by the sustainable and ecological insulation material Jute. “Thermo Jute 100” is a thermal insulation made of Jute fibres which is an adaptable material with excellent energy efficiency and sound insulation capabilities. It “snuggles” up to the timber and thus avoids sound transmission bridges. The flexible jute insulation is installed inside the stud frame where it regulates humidity, saves energy and heating cost in winter and keeps out the summer heat. The insulation material reaches best values in fire resistance and moisture protection. 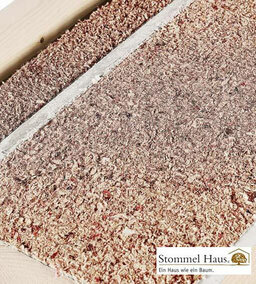 Alternatively the wall of a Stommel Haus can be insulated with Knauf Ecose which contains at least 60% recycled bottle glass bonded with ECOSE Technology which is a plant based adhesive. The material has got several certifications for its sustainability and ecology. 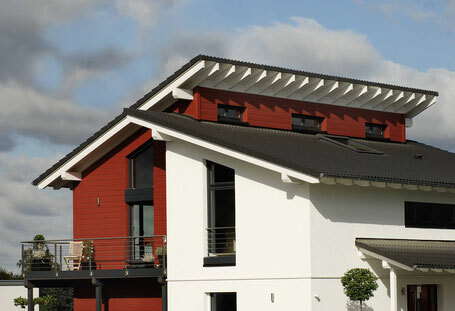 The Stommel Haus wall system provides maximum flexibility in the style of façade. You can select a sleek white rendered Bauhaus style, a rustic Chalet style timber exterior, the timber exterior of a New England house, or a mix of render and timber for a contemporary style of today. The timber is available with horizontal heartwood of 16 cm height or the “Fineline” façade with elegant grooves. Classic render is possible as well as a combination of timber and render. Each and every house is a bespoke design of the client and the architects; the material of the façade is selected to match the desired architectural style. The 15 cm thick partition walls are built as a 10 cm stud frame with 40 mm insulation of Jute or Knauf Ecose. The stud frame is planked on either side with double layers of 12.5 cm thick Fermacell . Fermacell is a very strong ecological and sustainable gypsum and paper panel with moisture regulating and sound insulating properties. It can be used in wet environments and supports the healthy atmosphere of the timber house. Its strength supports screws fastened without raw-plugs and can carry 50 kg per screw.